Cannot be Normal Summoned/Set. Must first be Special Summoned (from your hand) by Tributing 1 "Flower Cardian" monster, except "Flower Cardian Peony with Butterfly". 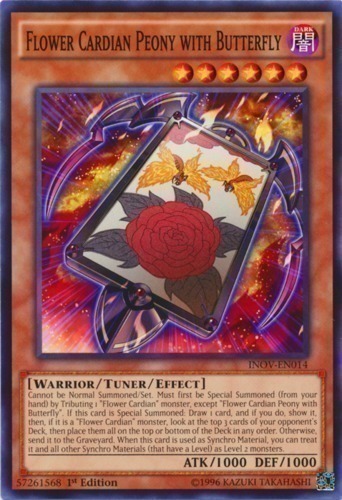 If this card is Special Summoned: Draw 1 card, and if you do, show it, then, if it is a "Flower Cardian" monster, look at the top 3 cards of your opponent's Deck, then place them all on the top or bottom of the Deck in any order. Otherwise, send it to the Graveyard. When this card is used as Synchro Material, you can treat it and all other Synchro Materials (that have a Level) as Level 2 monsters.